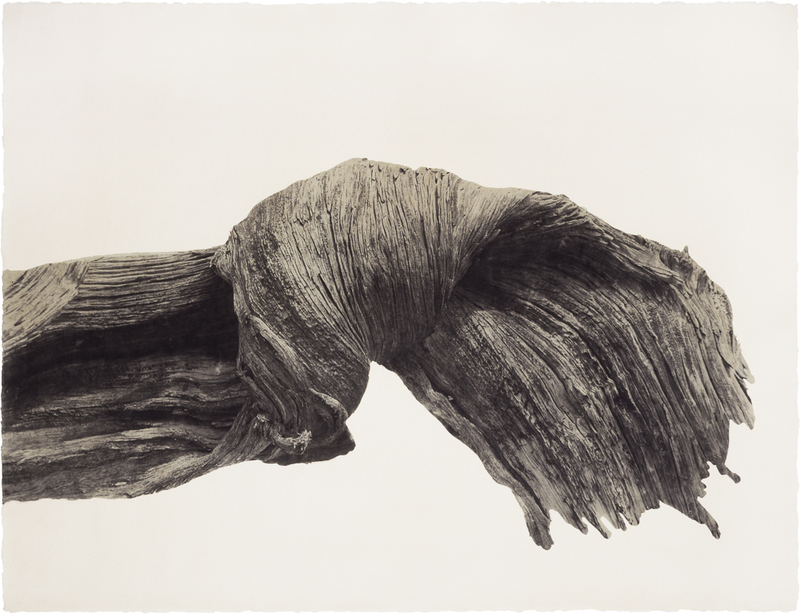 Over a period of five years during the 1990s, Jungjin Lee visited, re-visited, and photographed the American Desert. Now, more than twenty years later, this body of work has finally been published in Desert from Radius Books. 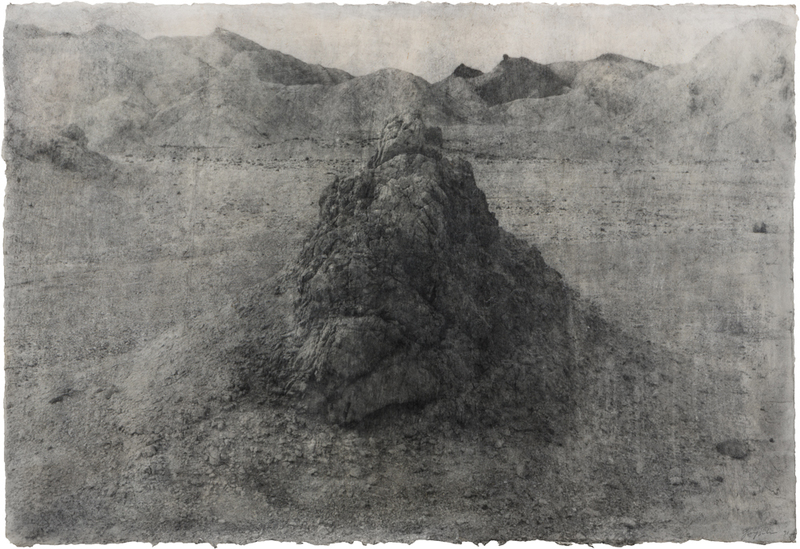 The pieces were only first shown in 2016 at Fotomuseum Winterthur, Switzerland, before which, Ms. Lee writes in her introduction, they “collected dust in the corner of my studio.” Who among us, as artists, does not have at least one project collecting dust – waiting for a time when it can be brought into the light of day? It was comforting to read these words, for while we may intellectually understand that some projects need more time, it’s a hard thing to look at a pile of work, the result of so many hours and so much effort, and just wait. In first looking through this book, I was particularly drawn to this aspect of the project, the exhumation and examination of “early” works by a celebrated and prolific artist. And while the title, Desert, was enough to ensure my attraction, as my heart belongs to the Southwest, the information this publication conveys about the artist is perhaps more compelling, especially for other artists. This element of change, even evolution, is reinforced in the design on the book. The content is divided into four series, American Desert I, II, III, and IV, each bound separately and packaged in together a large slipcase, along with a booklet containing the texts and image thumbnails. The large (10 x 14”) size brings to mind a sketchbook, and this size combined with the presence of multiple volumes further emphasizes the effect of looking at a process; the mental and physical act of creation. When we see or study art, finished work is often supplemented with the in-progress elements – more noticeably in painting and printmaking. I tend find the in-progress more interesting, and the images in the volumes have that quality – they appear finished, but when taken together, you start to read a history, a narrative of the entire endeavor. 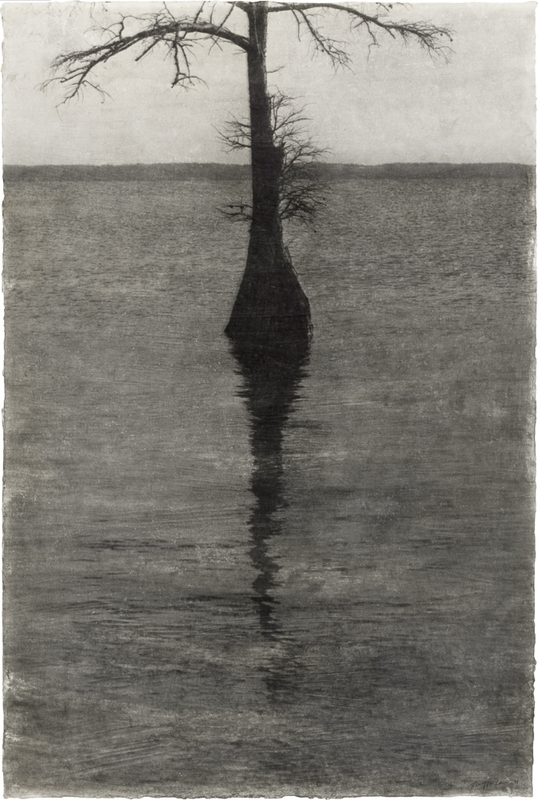 Volume I opens with an image of a single tree, reflected in what looks like the waters of an enormous lake. The sky and tree itself occupy a narrow band at the top of the image – the majority of the composition is made up of the reflection, the dark rough surface of the water and the even darker shadow tree. This first volume seems to contain broader, looser renderings of the desert landscape, but they are a little off – many natural elements are corralled in a vertical composition, becoming monolithic in quality: a tower of sandstone, an unidentifiable clump of vegetation, a clump of earth. The objects seem no longer bound to the earth, as context is methodically removed – horizons are erased, size is indeterminate, some elements even appear to be floating in air. The air seems thicker as well, like a pea-soup fog, we can see every molecule of whatever makes up the atmosphere in this alien place. In Volume II, the source images are suddenly layered in color. The black and white images are awash with a single hue, as if a filter or a gel had been applied. 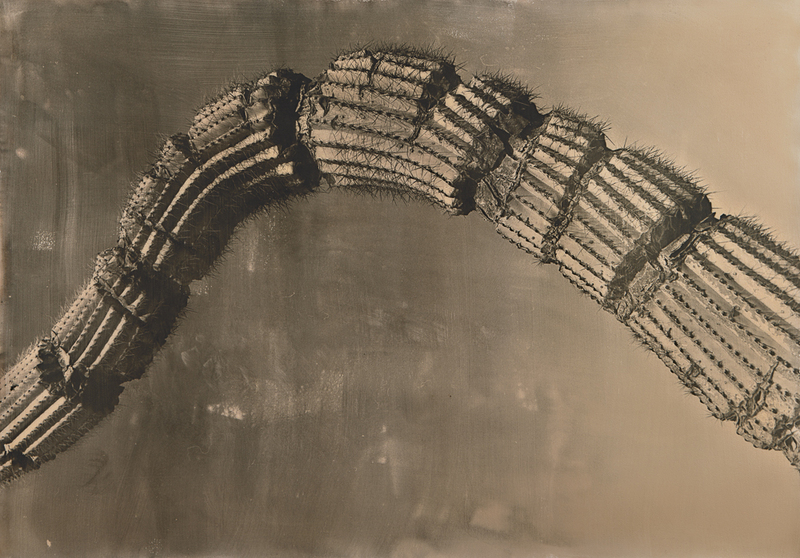 The subjects become more isolated, the objects pared down to a single formal element – the arch of a cactus, the corrugated surface of a hillside, a hole like a window worn out of a rock face. 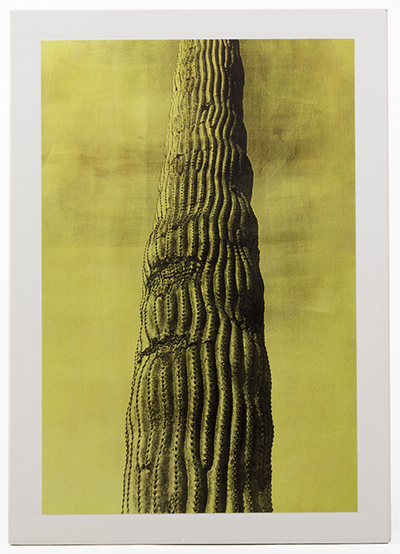 A few of the images, like one of a vertical spire of cactus painted shocking lime green (used as the cover image) seem well suited to this treatment, but in most cases I find the color is discordant; it seems like an afterthought. Volume III is comprised of a series of triptychs, all arranged vertically, but their orientation could be any direction. They show the figure of the artist for the first time, either in shadows or in distorted and fractured ways, as if this particular body is only another form, no different from the forms in the landscape it occupies. These communicate most effectively the repetitive nature of making images, and the monotony of revisiting the same landscape over and over. With these and those in the previous group, there is an overwhelming sense of play, an irreverence contained in them. 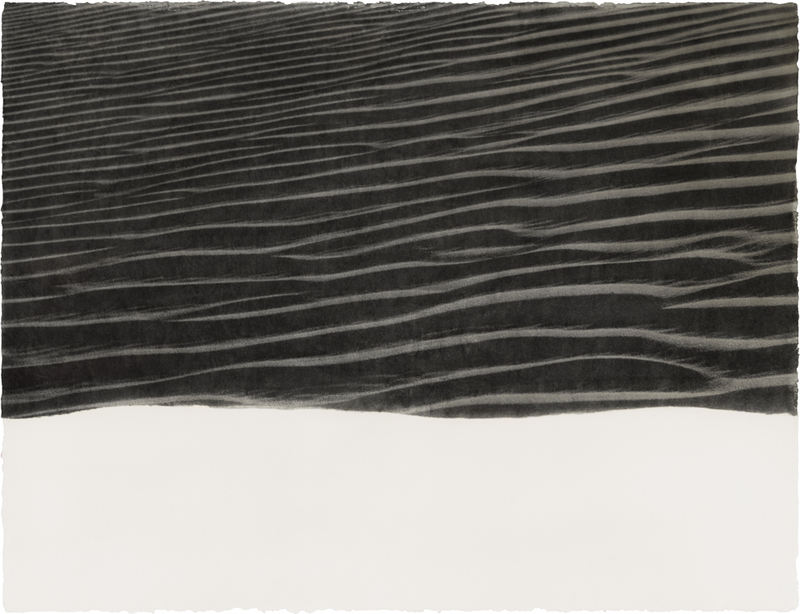 Volume IV is made up of two groups of images, one labeled Untitled and the other American Desert IV. The untitled images could be records of an experience in a particular place – a detail, a sketch, close attention paid to the mundane, akin to some of Lee Friedlander’s landscapes and his attention to the banal. Some use the vertical format again, in which the image is printed on the upper portion of the paper. More objects are catalogued, taking on the guise of artifacts: the sole of a shoe, an overgrown plant, a piece of a map. The lower portion of the paper is left blank, creating a block of negative space that grounds the image in a way – it creates an artificial ground or border, like paint swatches, or notes taken. Others are truly sketches, a swath of emulsion smeared onto the page, with a fraction of an image emerging through. For whatever reason, I imagine they are small – able to fit in the palm of one’s hand. 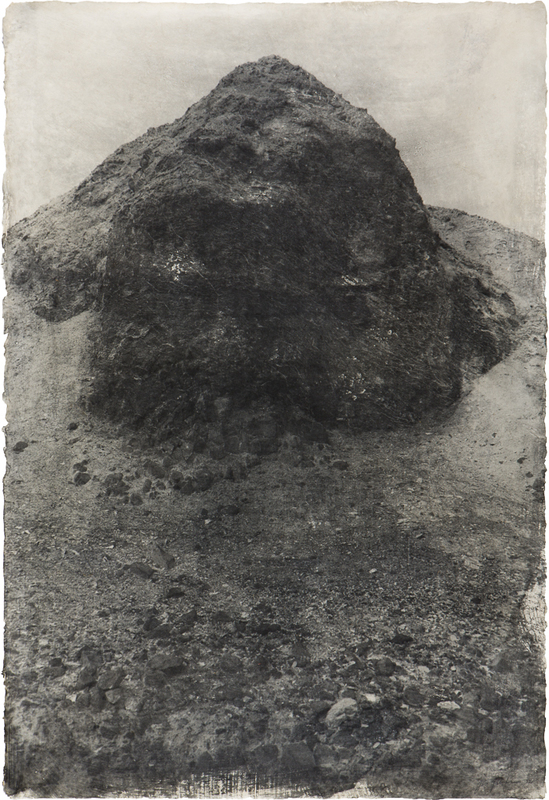 The other compositions take this experimental approach further, the imagery dictating the shape of the emulsion, the negative space of the paper left uncoated growing and becoming more dominant. 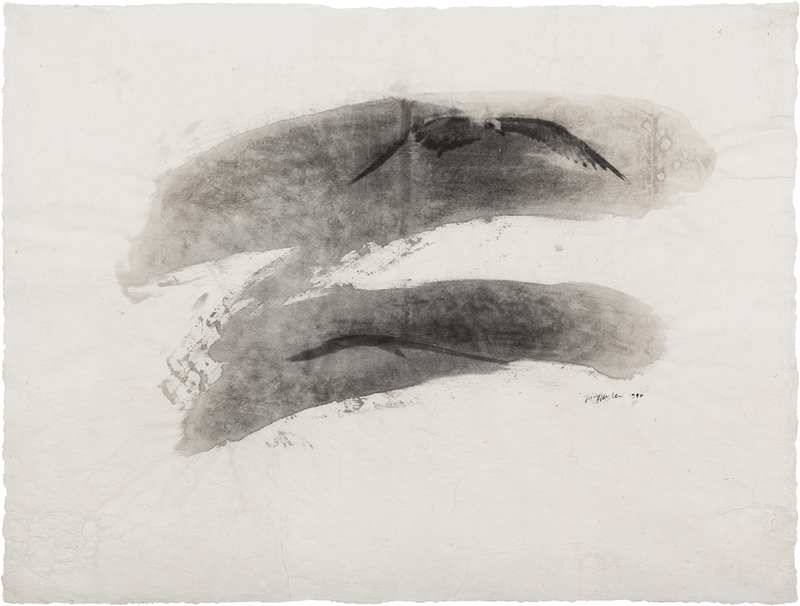 They could be lithographs, and it seems to me that methods of painting and printmaking were always in the artist’s mind – as she was not only rejecting her previous ideas of what beauty in art should look like, but what a photograph should be as well. The empty spaces Lee depicts are not really the American Desert, they are not the Southwest. The desert becomes a mechanism through which the artist can explore her own self. The allure of the American West has been explored exhaustively in photography, and even 19th century survey photography evokes the mystery of the frontier and the power of westward expansion. The Romantic ideal of the sublime, the combination of the beautiful and terrible and its power to destroy us, is perfectly at home here, but the vastness and emptiness of the desert is a metaphor – in occupying and representing these forbidding spaces the artist more completely inhabits and examines her mind, her own self. I agree with Mr. Frank’s statement. Desert shows us a portrait of the artist, as she allowed herself to operate without a map. The landscapes are spaces of discovery and transition, and the interior journey depicted within this book is as compelling as that of an explorer, venturing into the unknown. Jungjin Lee, in publishing this body of work, so many years after its completion, reminds us to consider the journey and the discoveries it enables. Lauren Greenwald lives and works in southern California. She teaches photography at MiraCosta College in Oceanside, CA.